Apr. 17, 2014 4:00 p.m. 1.) Approval to present a Rosebrier 4-H member with a $50 award and a plaque. The Club would decide who would qualify for the award, and why. 2.) 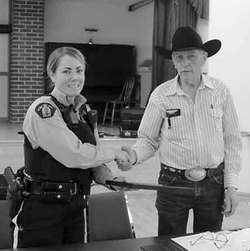 Approval to host a BBQ for members and families in August of 2014 to celebrate the 30th anniversary of Rosebrier Rural Crime Watch and Range Patrol. Both motions were passed. Tully also informed the membership that Crime Watch, Alberta would be presenting a resolution to the Government suggesting penalties for distracted driving infractions be doubled from $172 and demerits be added. He was confident that with 7000 members, Crime Watch would receive some attention. President Tully shared the appreciation the Rosebrier Rural Crime Watch and Range Patrol has for the ongoing outstanding service by the RCMP with plaques reading, “Rosebrier Rural Crime Watch Appreciates and Honours RCMP members as officers in our district for preventing crime. It is a privilege of having cooperation in making our community a safer place to live”. Recipients included S./Sgt. Gary Rhodes, Cst. A. Morin, S./Sgt. Grant MacDonald, Cst. Gordon Courage, Cst. Laurie McGilvary, Cst. G.D. Gurski and Cpl. Mike Zinck. For $20 members receive a 5 year membership and a gate sign. They also receive a numbered identification card that has been approved and recorded by the RCMP and coincides with their application. Residents can join the Rural Crime Watch by contacting Tully at (780) 352 0612 or by going to the Wetaskiwin RCMP detachment and filling out an application form.